The historian Dr. Herbert Ruland will speak at the IKOB with Frank-Thorsten Moll concerning stories about the East Belgian border and their relationship to the theme of rancour. The two discussion partners will highlight several stories that are typical of the East Belgian mentality and endeavour to bring these stories into relation to this year’s theme at the IKOB. In the new program series Moll trifft... the director of the IKOB, Frank-Thorsten Moll, invites guests from various areas of society to share in a discussion at the museum. Visitors have the opportunity of gaining information by themselves entering into conversation with Frank-Thorsten Moll and his guest. The focus of the new format is the individual relationship of the respective guests to the current exhibition as well as to the annual theme of the IKOB. The integration of contents from the media, interruptions of all sorts and a healthy portion of humour break up the familiar conversational routine and create an unhampered framework for a free-spirited and critical discussion. 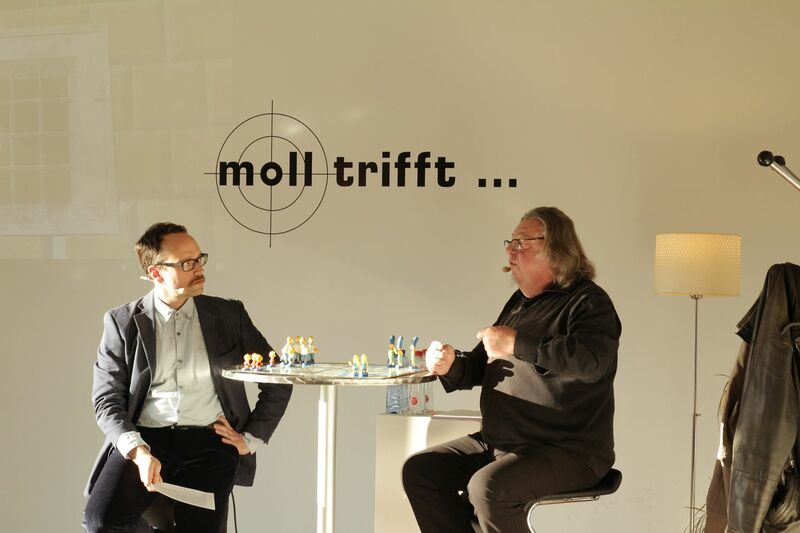 The series Moll trifft... allows visitors to participate in the discussion and promises an entertaining and stimulating evening at the IKOB!